I didn’t enjoy my sea-induced sleep for long: Maxi woke me at 2am, crying because she needed to go to the toilet ages ago and couldn’t hold it in much longer. You know, once you’re actually out your warm sleeping bag, stumbled into wellies and struggled into your big down jacket, it’s not so bad being up at Silly O’Clock. There’s something about a silent campsite that makes me feel a bit like a kid sneaking around on Christmas Eve. Maxi felt it, too. We strolled / waddled / giggled over to the toilet block, torch-light making the rabbits dance around us. They were as big as cats! We gawped at the bright Milky Way above us as we plodded on, and promised to stop and look for meteors on the way back. However, in a short few minutes the clouds lapped over the stars and, just as we reached the tent, the first raindrops fell. How lucky were we?! The pattering of rain on the taut roof, hissing waves and Mini’s piglet-snores in my ear sent me back to sleep. Normally I fight sleep, only closing my eyes when I can’t keep them open any longer, frustrated at the ‘waste’ of time. But the comforting sounds, wrapped around my most-loved 4 people, in my favourite place, relaxed me for the first time in months. Years! We unleashed the kids on the brilliant onsite playground to burn off some energy while The Boss packed everything away (he doesn’t trust my packing: he takes the gentle origami approach, whilst I favour the stuff-and-hammer-it-down method). Midi taught Mini how to hurtle down a zip-slide without rapid death ensuing. All sorted and car shifted by 10am, The Boss announced that it time to hit the beach. The minxes and I settled into our usual beach routine – climb anything not moving / draw lovehearts with ‘Mummy’ in it to earn an extra massive hug / build a big beach collage / turn over every rock to find a starfish – while The Boss had a clamber around sites of near-epic bike crashes in his past life. Hiding or in a strop? By the time the tide came in and shepherded us back to the main bay, it was about time to sort out a treat lunch: Scribbles Pizza Restaurant, scene of many a minx disaster and wonder and our favourite place to eat in Elgin. Although the inside has been completely renovated since we last visited 3 years ago, they still make my favourite beef chilli melts (I craved them throughout my last trimesters when I was expecting Midi and Mini) and the coffee and walnut cake was just as delicious as I’d remembered. Got my beef chilli melt – happy tummy! Cummingston gorse – if only that scent could be bottled! With sunshine fighting back against the drizzle and our little bubble of nostalgia unburst, we drove back again to one of our favourite beaches: Cummingston. At this time of year, the gorse is incredible: a coconut sunscreen scent hangs over the whole area when it’s hit by sunlight. All 3 girls love the looooong slide at the playpark because it feels scary. As does dodging the nesting seagulls dive-bombing people who get too close to the cliffs, but today we wanted to look for cowrie shells and sea-glass so headed for the beach on the far right initially. Although we could have happily stayed for many more hours, eventually we realised that at 6pm it really was time to reluctantly head for home. We only winkled the minxes back into the car by promising to come back to the area the very next weekend that we could. It was an easy promise to make, and personally I can’t wait! Are you *really* suprised that Mini goose-steps?! 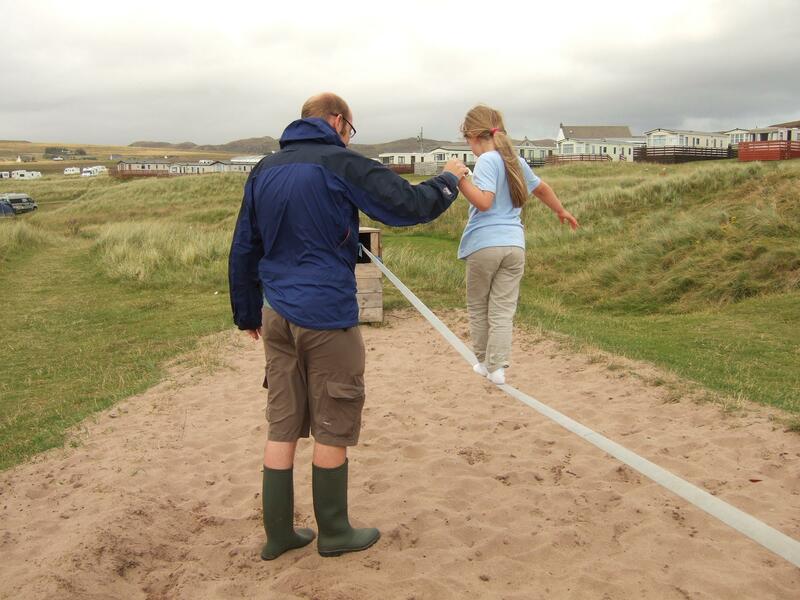 We all felt sad about not getting out camping and were getting fed up rattling around the house – the week had started well with visits around and about but the weather forecast was miserable for the entire weekend. In occasional bouts of nostalgia and wistfulness, I sometimes check the forecast for the area where we used to live. This weekend it would be mild and dry there. A quick Google showed me I could get a nearby campsite place for under £15 for Friday night. It didn’t take me long to convince the rest of the family that we should go. We loaded the car on the Thursday night and set off for Elgin before mid-morning. With that Historic Scotland membership still shiny and new and with the sun splitting the heavens, we made a bee-line for Elgin’s ruined cathedral. Despite Elgin being our nearest large town for 6 years, we’d never explored or even looked twice at the cathedral. Within 5 minutes of entering, I was regretting leaving our visit for so long! Elgin Cathedral made an even bigger impression on us than Melrose Abbey the week before, which is why I’ve written a separate post about it (I’ll amend this to add a link). The nerd tent: bigger on the inside than the outside. A quick packed lunch in the car and an emergency outgrown waterproofs purchase (Maxi and Midi are growing like weeds), and it was time to drive to Silver Sands campsite just outside Lossiemouth. As it’s mostly laid out for static and touring caravans, there’s only a little grass area set aside for tents. There was plenty of space, though: not many campers fancy pitching a tent in sub-5degC weather. We didn’t hang about: our little Vango Halo was up in a couple of minutes, every tent peg we owned holding it into the sandy ground against the wind! The minxes were delegated the job of jigsawing together the foam floor and placing roll-mats, sleeping bags and pillows. 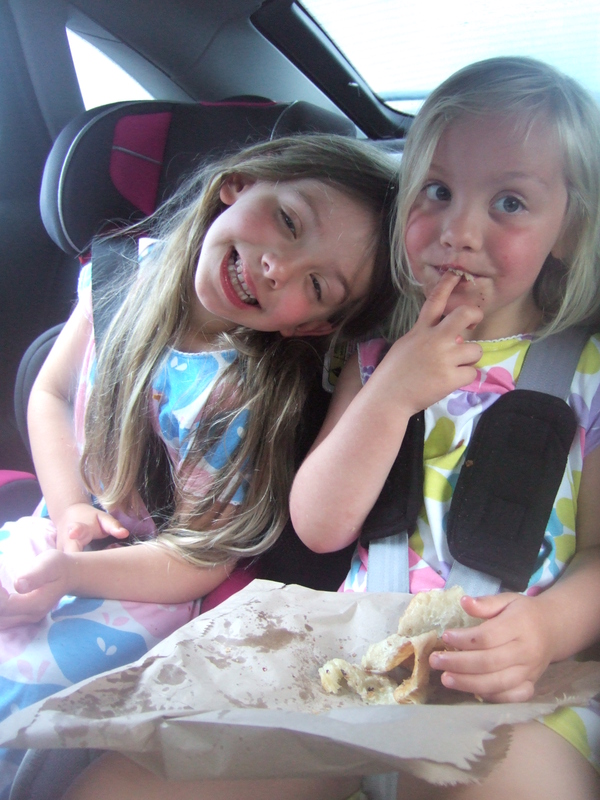 I tried hard to ignore the wails and screams that constituted kids negotiating who slept farthest from whom and closest to “Squashy Mummy”… Camp struck, we hopped into the car and nipped off down the back road to see whether the fish and chip van still visited our old village on a Friday evening. We were so overwhelmed at seeing the fish van and some old friends in the queue that it took us a wee while to notice that the land it was parked on had been substantially prettified: beautiful plant beds and borders and decorations. Colourful, beautiful and a visual testament to great community spirit – the villagers had done the work themselves. We strolled round the corner to the sea front to gaze out over the Moray Firth towards Cromarty while we ate our chips and creamy fish. All 5 of us sat silently, 3 minxes on one bench, us crumblies on the other, happily munching and smiling and reminiscing. Ahhhh, despite the chill, life just doesn’t get any better than this! Tummies full, we walked back towards the car with a quick detour via the brilliant climbing wall along the side of the school. We should have driven back to the campsite then, but only got a few feet before all agreeing that we had to stop for a quick play at our old swing-park. I think that was our mistake – by the time light was fading and we had to leave, we had 3 sad little faces in the back seat. Mini burst into tears and declared that she never wanted to hear the name of our old village again. “Never say that word again!” she sobbed. Amongst the family, she wanted us to rename it “The-village-where-we-used-to-live”. I think a lot of the tears and emotion were down to being so very tired out. However, I didn’t feel too even myself. I’d have loved to have said hello to our old friends, but I couldn’t really face walking up our old street and it would have been rude and too much of a surprise to just drop by unannounced. Back at the campsite, we quickly got sorted out. We could have been very distracted by the tvs in the wall of the bathrooms, but were too tired to linger over teeth-brushing. The girls sleeping-bagged up and collapsed in a big huddle. There were snores almost immediately. The Boss and I just about managed to stay awake to enjoy a shared bottle of Tiger beer (I volunteered to have my half in a water bottle – classy) before we squeezed into the huddle, too. For once, I enjoyed a little bit of insomnia, lying there listening to the wind rattling guy-ropes, the scree of the oystercatchers and the insistent swoosh of the waves, idly NOT planning the next day’s fun. 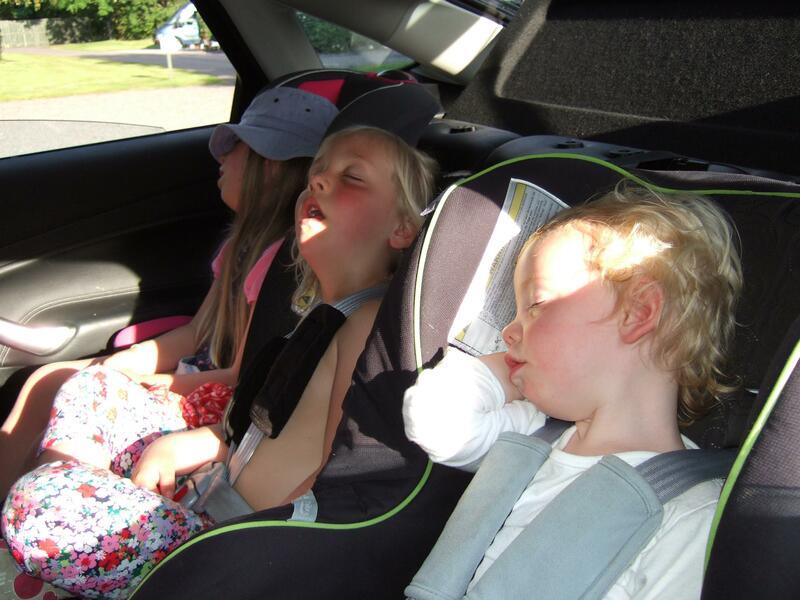 The Boss and I had spent since Friday lunch-time packing, stuffing and loading and finally shoe-horned the kids into the car just before midday Saturday. One last check of the long, long list and off we set for 6 days camping in Northumberland! We’ve never been there and were looking forward to exploring it and hopefully enjoying the driest and mildest weather around. Except us being us, it never quite happens like that, does it…? We arrived at the campsite, Waren Mill, around 4.30pm. The rain had stopped for a little bit but the fog hung in curtains over the sea, so undistracted by the hopefully gorgeous views, we got our pitch allocation, drove round to the wonderfully empty field, released the delighted and squealing minxes into their natural habitat, and quickly set to work erecting the behemoth tent (Vango Maritsa 500). 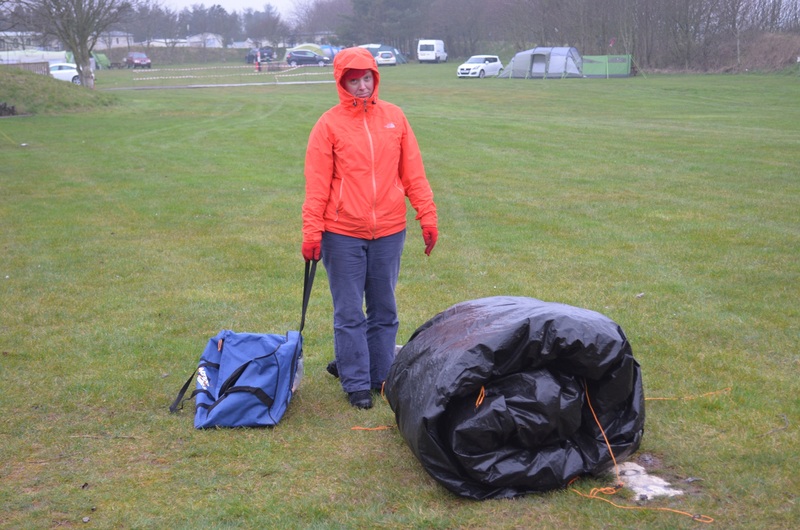 The little puddle in the bottom of the tent bag was a bit out of place, but as we unfurled the tent and poles and pegs, everything seemed fine: well, it had started to rain again. Like a well-oiled machine, The Boss and I took opposing sides and slotted the heavy poles into place. A bit of heaving and juggling and wishing we’d another 3 pairs of hands to hoist it (as yet too short and not strong enough to meaningfully help), and the tent was up. Hooray! Just as the rain really started to come down. 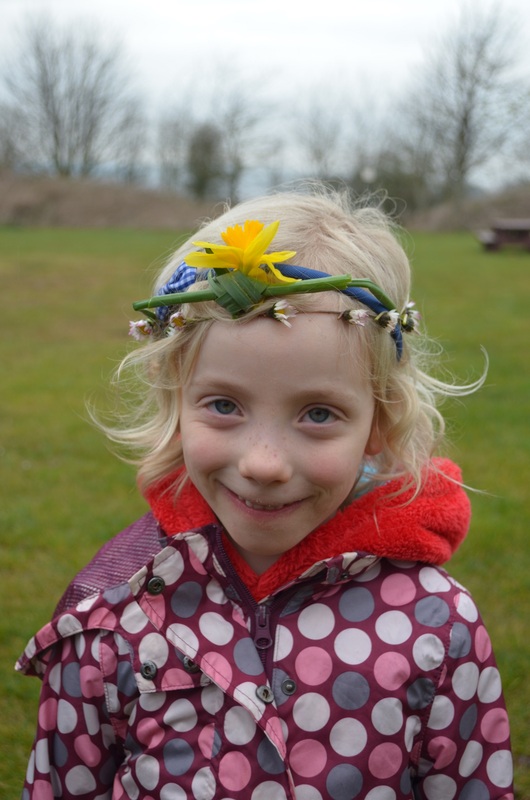 We ordered the girls away from their daisy chains and daffodil crown-making and temporarily into the car while we painstakingly pegged out the tent, re-centred it on the placement as instructed, untied and retied the guy-lines, pegged them, meticulously opened and pegged the vents… Och, you get the picture. We know from long experience that time spent at the beginning getting it right pays dividends when the heavens open in the middle of the night. As forecast throughout the week ahead. Along with the hovering-just-above-zero temperatures. I called The Boss over for reinforcements / moral support / possibility of blaming him. He tried everything I had (except for the shouting – he doesn’t really do Drama Queen). We remembered the tent has 2 other entrances, so he unpegged one and tried to unzip that. No go. With a “grrrrrRRRRR!” he finally managed to open it. I ran round, shielding the inners from the rain with my wet head and tumbled inside. Dear goodness, the place stank! And the floor was wet. Very wet. This didn’t bode well at all. I called for the cloth we’d packed to mop up condensation in the morning. It just smeared the water around. I considered sacrificing a towel. The Boss came back with a penknife, so we left the puddles and prioritised taking turns to chip away the salt around the zip of the front door from either side. Chip, chip, chip, pull. Chip, chip, tug. Chip, yank. Like a pair of archaeologists we painstakingly dug out the zip. Finally, finally, we got it to open! We brushed off all the detritus and zipped back and forth, back and forth, freeing the teeth. It worked. Ish. Hooray! Right, now to investigate the water. And the smell. Well, the smell was easy – every single seam was mouldy. All the once-clear windows were now entirely opaque. The zips at all the windows were jammed shut with similar powdery gunk to the front door zip. Ew!!! 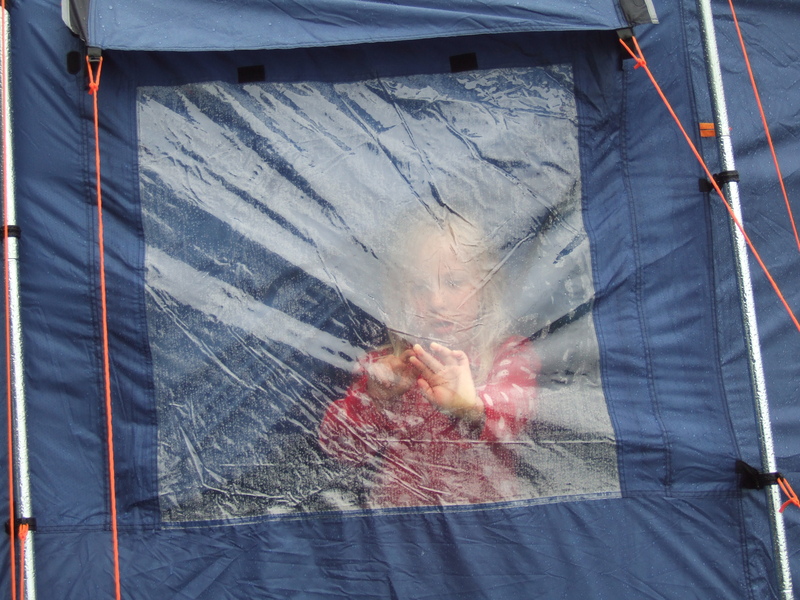 Maybe if the rain stopped and the wind started up, we could air the tent…? I looked at the rear ‘rib’ that the bedroom inners hook onto. Sodden. How could I get that dry? No new drips on the floor – good, at least it’s not leaking. Hopefully. I looked at the central ‘tower’ that the inners also hook onto and where we store our clothes in. Mouldy, wet through and actually disintegrating. Was I really going to connect the bedroom inners to this? Was I really going to sleep in here? Were we really going to subject our little kids to this? I called The Boss indoors for an emergency conference. His wee face fell as he looked around: I didn’t need to explain. He suddenly frowned at me and asked if I was wheezing. Yes, my chest did feel very tight, but was that because I wanted to cry…? We looked again at the main sticking zip. Still sticking. I worded what we were both thinking: “What if we need to get out the tent tonight in a hurry and the zip sticks? That’s so dangerous.” We knew what we had to do, but decided to sit in the car with the over-excited minxes and discuss it in front of them, reluctant to actually make the final decision. In 100% humidity, it wouldn’t dry out. We couldn’t sleep there overnight. We probably couldn’t sleep there ever again. We couldn’t clean it and we couldn’t replace the zips. And not being able to get out was too unsafe. We’d have to junk the tent and abandon the camping holiday. “Just the pegs. The unbent ones”, he said sadly. Right. No time for hysterics. It was already after 6.30pm (why, oh why, oh why could we not have discovered this before we’d spent 90 minutes setting the tent up?!). We were undoubtedly not the first campers this had ever happened to. Perhaps the campsite staff could suggest a cunning plan while we were still reeling in shock? The Boss called the Emergency Warden, who suggested staying in one of their wigwams or caravans overnight and sorting ourselves out in the morning. Brilliant! She promised to call back with the details. In the meantime, The Boss and I set to work dismantling the tent and taking it to the skip. The girls cried and hugged each other. I felt a terrible heart-pang myself, remembering some of the fantastic holidays we’d spent in it: camping in the garden and horrifying the neighbours with the kids’ screaming and shrieking; our first family-of-5 camping trips; the camping that kept our family together 2.5 years ago (no-one was coping with The Boss commuting at weekends with his new job, so we spent the summer holidays camping at the campsite closest to his work). Had it really been 2.5 years since we’d last used The Behemoth? We’d camped lots since. Right enough, we’d used the little 3-man tent instead each time. The Boss sheepishly admitted that he vaguely remembered putting the big tent away with a wet groundsheet that last time and waiting in vain for a dry day to put the tent out in the garden and dry it off properly. Normally I’d have screamed like a banshee at him, but the error was 3 years ago. Could I have promised back then to sort it out instead? A dim memory stirred in me, too. We were probably equally culpable. 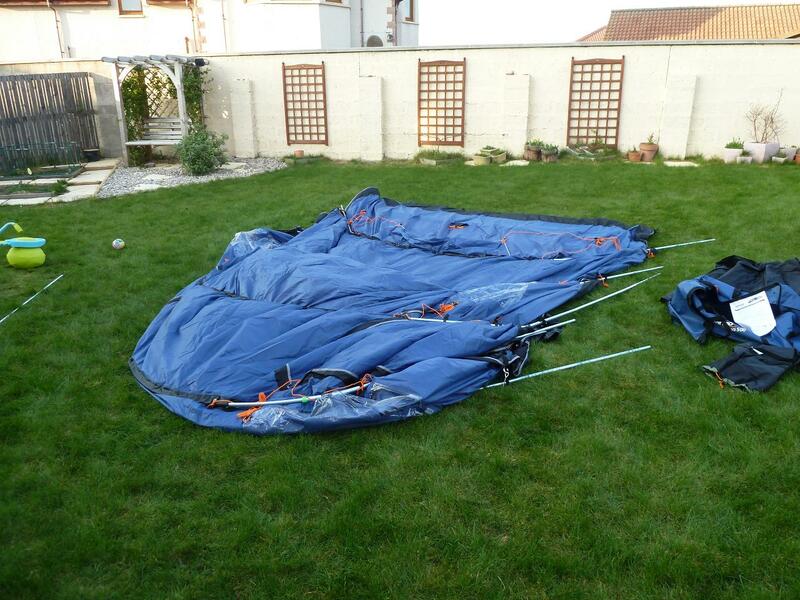 Why had we not got the tent out and aired and checked it before booking the trip? We normally would have. Oh yes – because it’s barely stopped raining since last August. Meh. How would we ever be able to afford to replace this? We said goodbye and thank you to the tent as we stuffed it in the skip. The Warden called back as we sat in the car sheltering from the rain. Unfortunately they were fully booked. She was ready with details of how to get to the nearest Argos and outdoor kit shop and their closing times so we could nip off and buy an emergency tent. We thought about it as a family. Maxi immediately said that it would be daft to buy a little tent when we already had a 3-man one at home. I pointed out that a cheap tent wouldn’t cope with the forecast daily rain over the next week. Midi asked whether we’d get any money back at all. The Boss said no, it wasn’t their fault at all and they were only being helpful because they were kind people – we’d lost our money. Mini cried anew over her forgotten giraffe stuffed toy. Damn. No tent. Bad weather. Upset family. I calmed the kids down and explained that things in life didn’t always go the way we’d planned. We could either sit and be miserable about it forever, or we could choose to make the most of it. The Boss and I agreed that we should eat first, discuss it all over dinner, then make a move, whatever that move was. The campsite had a restaurant on-site that we’d planned to eat at on the first evening anyway, so we did just that. Over the next hour, we sat waiting on dinner, fielding ideas. Mini suggested that we go home that night to get Giraffe. We agreed that would be the most sensible and cheapest thing to do. But we didn’t want to. And the longer dinner took to arrive (the restaurant was very busy), the less likely we’d be able to make the 4 hour drive – The Boss and I were exhausted. Midi suggested that we stay in a hotel overnight then spend tomorrow having fun somewhere and going home tomorrow night. Aha, now that’s more likely! Then we could stop stressing about getting home at 1am. But we only had our budgeted spending money left. We sat watching the painfully slow wi-fi load LateRooms.com pages onto The Boss’s phone every 4 – 12 minutes (yes, I timed it). LateRooms turned up nothing. The problem of having 3 children and not being able to afford 2 hotel rooms! We called the nearest Premier Inn. No, they absolutely would not let us share one room. Please? No. Pretty please? No. We tried a few other websites. Nothing. The phone signal waxed and waned and the wi-fi ground to a halt as the restaurant got busier. We ate our fish and chip dinner and decided to set off before it got any later (it was 8pm) and just hope for the best. We let the Warden know we were leaving and thanked her profusely for trying so hard to help us out. As we approached the A1, The Boss’s phone picked up 3G signal, so he checked out the Edinburgh Premier Inns. He phoned the Musselburgh one direct. The lady on the other end said the same as her colleague in the more southerly hotel: that we couldn’t share, and that she only had one room left anyway. Voice cracking, The Boss explained that we were actually quite desperate, and told her our tale of woe. The lady sympathised. She talked to her boss. She relented and said she’d do her very best to get the room ready for the 5 of us before we arrived. An hour and a half later, after a slow and difficult drive through thick haar fog, we arrived looking like red-eyed survivors from the rainforest. The lovely receptionist made us feel safe and welcome and commiserated with our bad luck. She even apologised that Mini would have to share with one of us. We didn’t care – we had a place to sleep that didn’t drip, creep, splosh,smell or give us asthma! 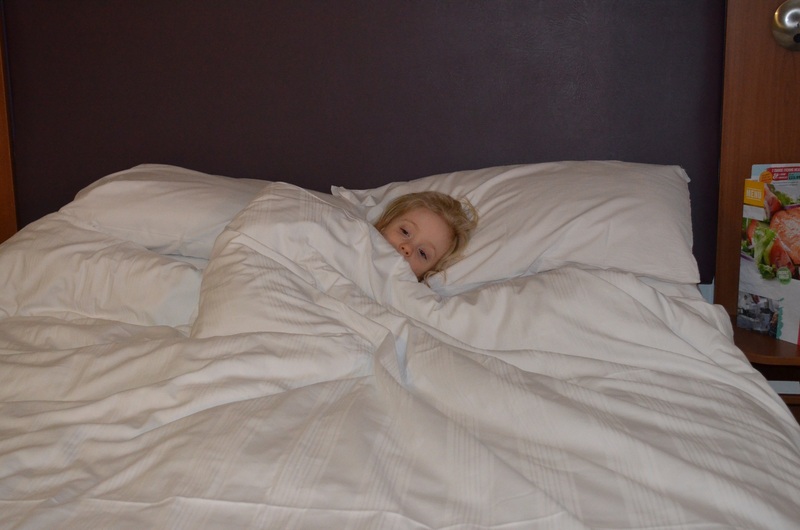 Don’t care where you lot are sleeping – this is MY big bed! Well, I say sleep – the kids slept well. Mini slept like a whirling dervish. Occasionally she’d punch me in the kidneys, slap The Boss, kick me in the stomach, rouse and demand that she be handed Midi’s Heffalump to cuddle, then kick the covers off and snore and splutter in The Boss’s ear. The Boss and I just clung to the edges of the bed either side of Mini and felt thankful for a room! So, Pop Kids, what have we learned from this sorry tale? Always, always, always dry your tent. Somehow. Find a way. Just do it. Don’t ever leave it for 3 years. Always get your tent out to check it before you set off on holiday. Even better, get it out and check it before you pay for your booking. Always have a back-up plan; a proper if-all-else-fails plan. That doesn’t involve driving through the night in haar fog when you’re tired. 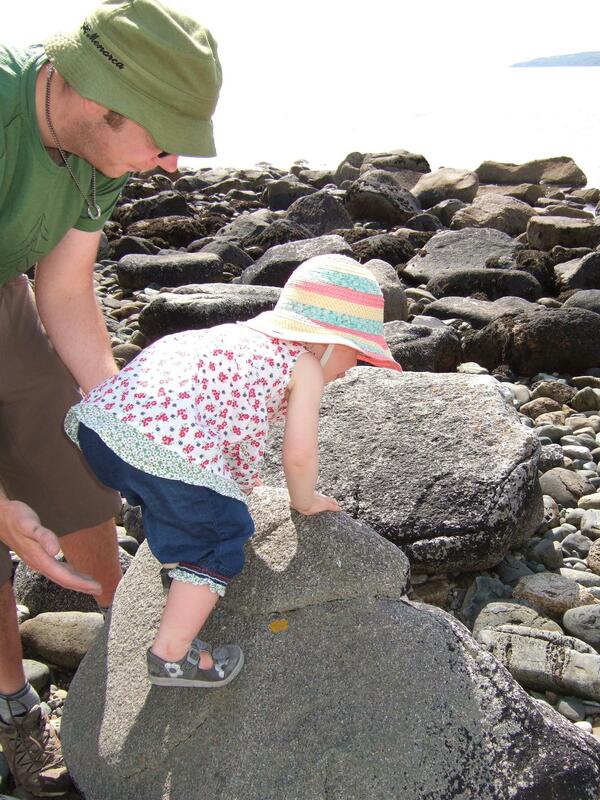 Involve the kids when you have to make tough and upsetting decisions – they’ll feel less helpless and will burst with pride if you use one of ‘their’ (cleverly-planted and set-up) ideas. For the first time *ever* when I’ve been camping, I woke up at 7am (lie-in!) feeling rested and full of life. Wow! Maybe it was because Mini Minx had her little arms squeezed tightly round my neck and was snoring in my ear. What a way to wake up – cuddles and baby’s clean hair smells in my nose. Just lovely. The Boss woke and kindly volunteered to get up right away and put the coffee on. And there the lovely morning came to a screeching halt. Now, I’ve met midges before: I’m Scottish. But these weren’t ordinary midges. These were FuckinBazzaMidges. Vicious, voracious, vindictive. And they cut about in thick clouds of a few billion. I sprayed Smidge on everything and everyone. To be fair, it stopped them biting, but it didn’t stop them marching on an expedition up my nostrils, in my ears and crawling all over my eyelashes. Argh! So much for the forecast stiff breeze – it was sunny and still and we were a stone’s throw from the sea – of COURSE they’d be out hunting for fresh blood! We slowly got ourselves together, took the minxes in relay to the toilet block, and… suddenly the heavens opened. Eh? But the forecast was sunny intervals, breeze and warm. It was still, chucking it down, and freezing. I guess the Met Office were still away on their summer holidays and Colin the Janitor’s Dog was still in charge of forecasting. The Boss was a bit of a hero and legged it back to the tent and car with Mini, and drove back to rescue me, Maxi and Midi. We didn’t know that – we were about to brave the torrents, and he pulled to a halt in front of us. We sat steaming up the car, wondering what to do. Well, easy: buy some freshly baked croissants and pastries from the campsite shop (see? I told you it was excellent!) and sit happily munching them, waiting to see what the weather will do. (Have you ever burnt your mouth on a croissant? I hadn’t. Till now. An interesting new experience). After a mooch around the harbour, we decided to go back to the beach near the campsite. Oh my word, what an enormous stretch of sand! It was still cold and windy (aye, NOW the forecast wind arrives! 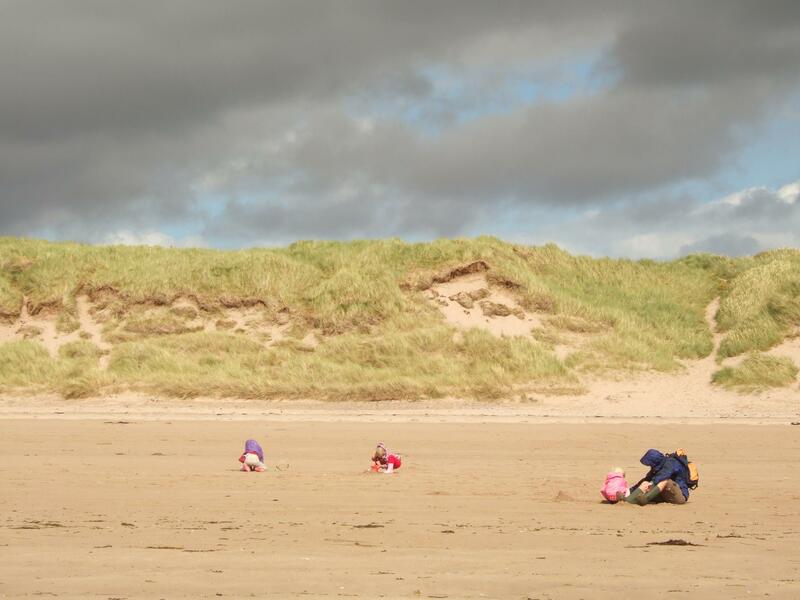 Long after the midges have departed) so we didn’t spend that long building sandcastles (Midi and Mini Minx) or elaborate huge sand forts (Maxi the Artist). 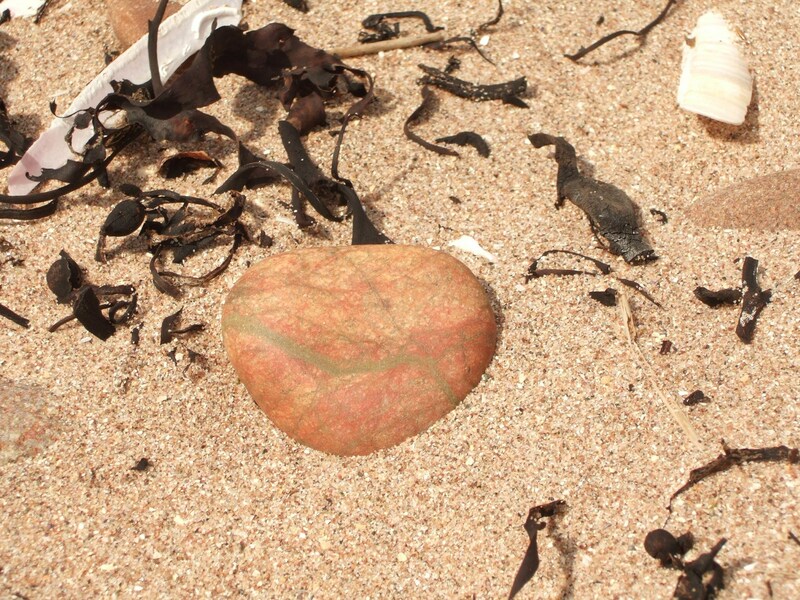 We strolled down the beach, past the washed-up dead seal (oh…) and explored the rock pools, shells and amazingly colourful rocks: thick bands of blue and white stripes, and crazy paving of red and green. Beautiful! Eventually tiring of the beach we tried the playground on site. I’ve never seen a playground with a slackline before! 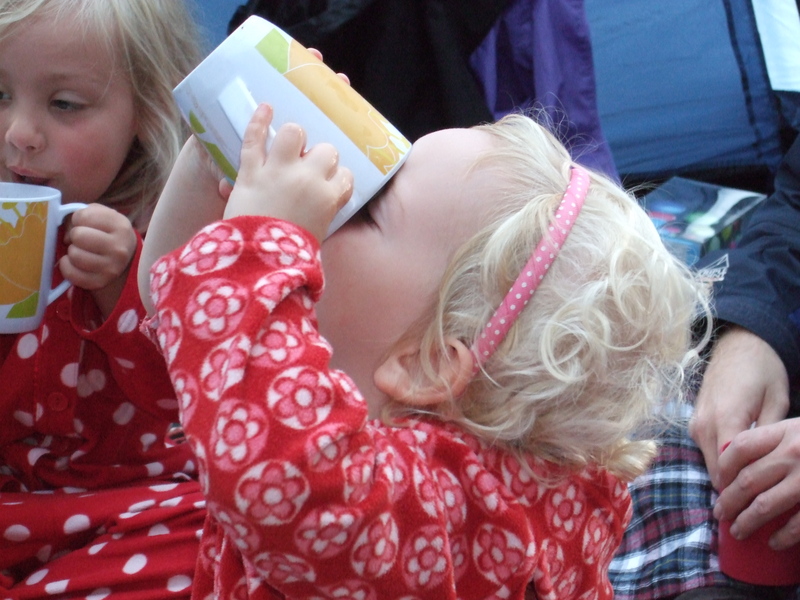 The kids absolutely loved it, and would have still been there now had they not gotten hungry for our now-traditional camping dinner of Pasta ‘n’ Sauce. Speaking of which, we had the sense to cook and eat it in the big garage-building. We could have used the coin-operated microwave, but (a) it was more fun for the kids with the burner*, and (b) it was more fun watching the German couple having a nightmare microwaving pasta in teeny tiny containers – they giggled more than we did. 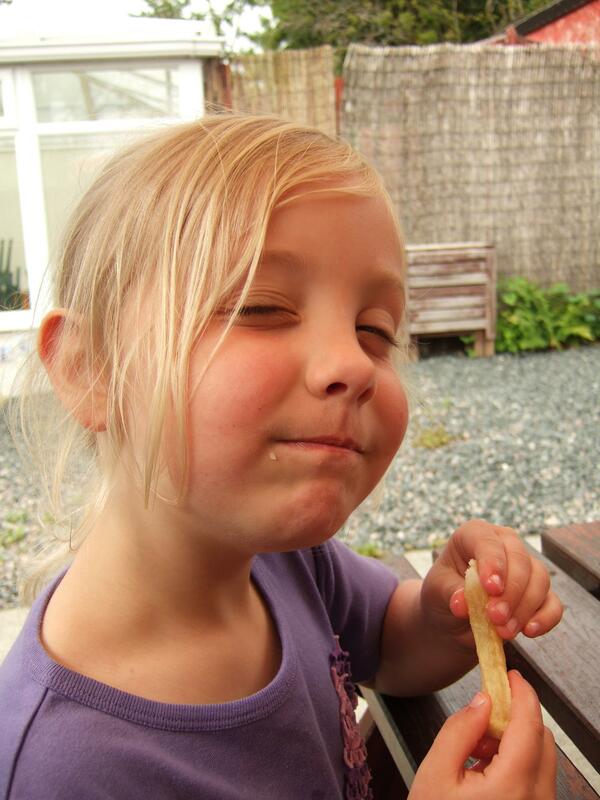 * Remember: little kids will eat anything if you either call it ‘picnic’ or cook it on an open flame. Anything. Seriously. I think around about then maybe the little glimpse of sun got to me. Either that or the BeeGees earworm that the local radio had inflicted on me, but I was seen in public doing a BeeGees / Usain Bolt impression. Ah yes, I don’t think I need to practice anymore to achieve full Embarrassing Mum potential. 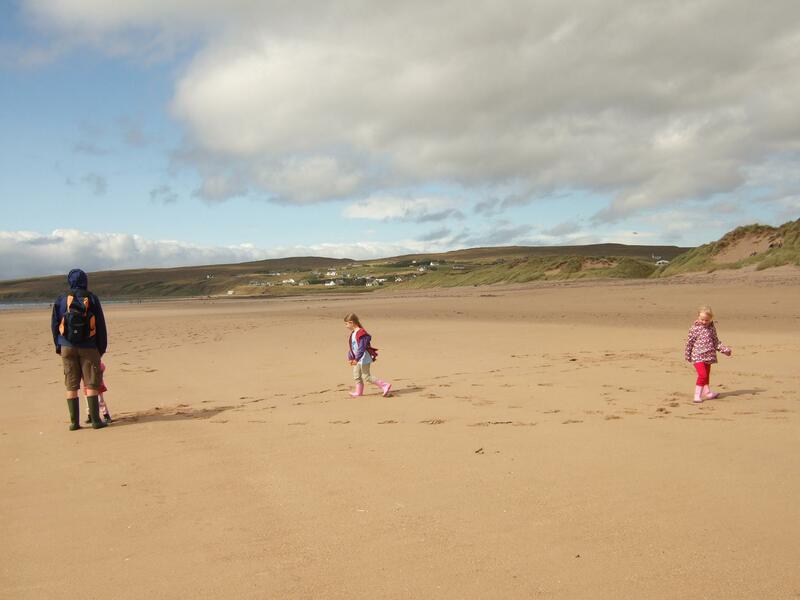 In a final, last of the school summer holidays fling, we spent the weekend in Gairloch. The car was packed and ready to go the night before, I fed the minxes and had them in their pyjamas from 1700hrs, so we only had to wait on the The Boss arriving half an hour later and off we zoomed! The rain stopped and the clouds parted as we left Inverness and headed west. The road was absolutely empty, so I enjoyed being Mondeo Mummy (like Mondeo Man but with more hormones). We inherited the car from my brother when he gave us Foster Cat to look after, and he always raved about the ride. 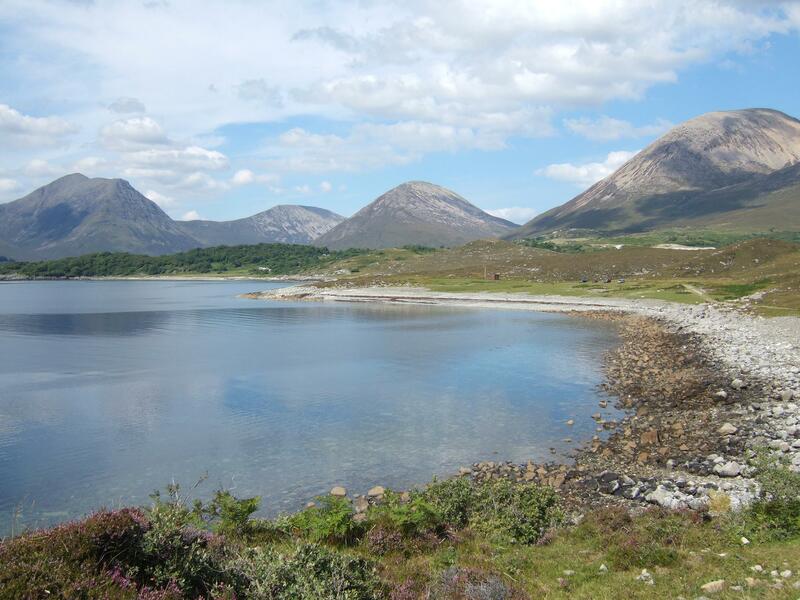 Throwing it around the single track lanes to Gairloch*, I saw what he meant – even the minxes were comfy in the back. (*though I have to stress [this being a family show ‘n’ all] that I didn’t speed and was a courteous driver to other road users at all times. Even the biffs. Honest). 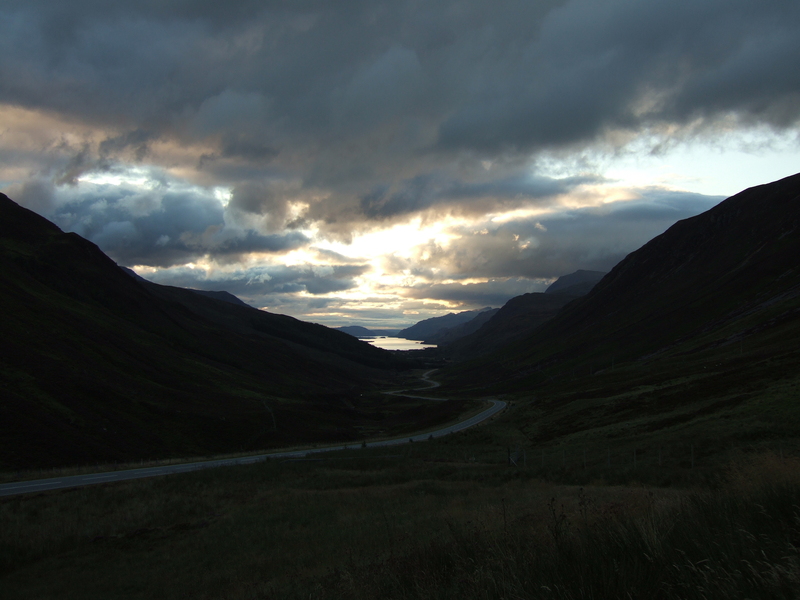 The view down to Loch Maree through Glen Docharty. Go on, click to see it larger! I love our big old Vango Maritsa 500 tent, but my God I cannot be arsed putting it up and taking it down every time I want to nip away for the weekend. That’s a half hour and an hour respectively when the minxes aren’t properly tethered supervised. Knowing that we wouldn’t arrive at Gairloch much before 2130hrs on a Friday night tipped the balance: this time we took our ancient, trusty Vango Storm 300+. 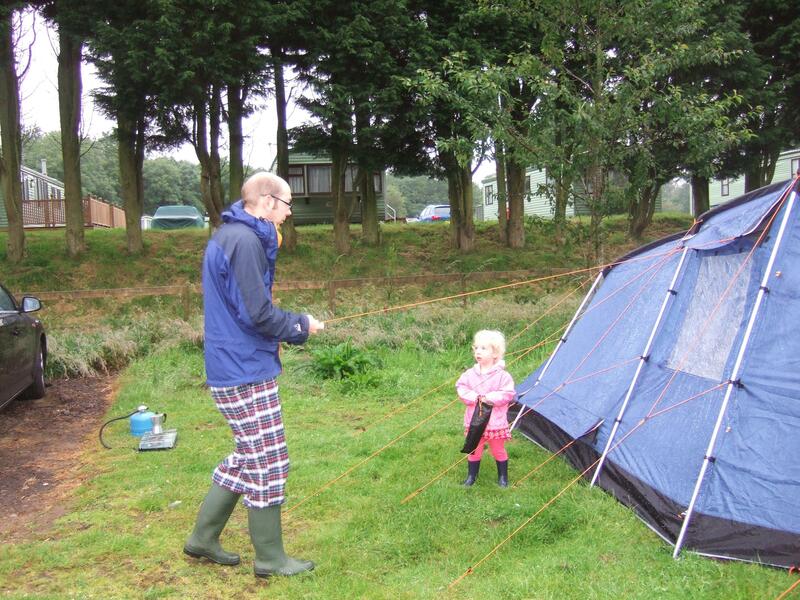 That old tent did us proud before Maxi Minx arrived, and she even camped with us till she was 1. Best of all, it can be put up in around 5 minutes. Well, shortly afterwards we pulled into the best UK campsite I think I’ve ever stayed at. Amazing scenery, absolutely huge, and no set pitches: so long as you keep 7m away from any other tent, you can pitch where you like. Rather than head for a pitch with a view, we aimed for the pitch that kept our noisy girls the farthest away from everyone else. The ‘calm winds’ that were forecast felt like a steady 30-40mph to me, as The Boss and I pitched our tent by headtorch light. It took 6 minutes to get it erected (we’re out of practice…), another 15 mins to stake it to the ground and do the guy-ropes (they’d never been used, in hundreds of UK and French camping trips – I guess we’d been fair-weather campers after all! 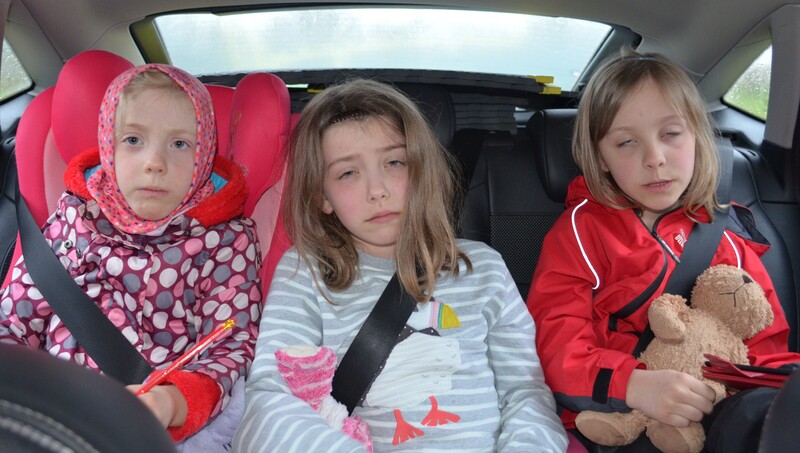 ), 30 seconds to sling in the self-inflating mats, pillows and sleeping bags and 10 seconds to prise the minxes out their car seats. I took them to the toilet block to case the place out, relieve little bladders, brush teeth, etc. It was like a scene from a horror film, Revenge of the Crane-Fly. I’m not scared of Daddy Longlegs, but The Boss sure is. And when you lose count of how many of the fluttery wee beggars there are in one toilet cubicle alone, you know there are a LOT… I did the honourable thing and warned him. I think he brushed his teeth outside… We sat up for a bit while the minxes snored almost instantly (Yes!!!! At last!) and watched the ISS go past. And again, 40-odd minutes later. It got a bit cold to be sitting outside in the howling wind, so we sat in the car, him playing with his iPhone and me knitting by headtorch (it was a gift, rather than a Rainbow Knits woolly creation, so that’s allowed). When the ISS went past yet again, we headed for bed. So, how do you fit 5 trouts into a 2-3 man tent? Well, you put Grumpy and Scared-of-Cranefly Trout head to head in the middle with their feet at each corner, like a bottomless triangle. And you let the 3 minxy trouts doss in whatever position they find themselves in at any given moment. It was surprisingly comfortable and we all slept very well. Another threatening-to-be-grim day, so we cracked on with boiled eggs and double espresso (adults) or a big mug of UHT milk (only minxes can face this) for breakfast. It took us ages to get going because all 3 minxes needed showers, one at a time, waiting in queues before and afterwards. We were all grouchy from accumulated lack of sleep so snarled and grumped a lot. Camas Malag: the track opened out into a kind of wild camping field. Instead of turning, I got out and had a snoop around just in case the promised sandy beach was just out of sight (it wasn’t – the map lied again). 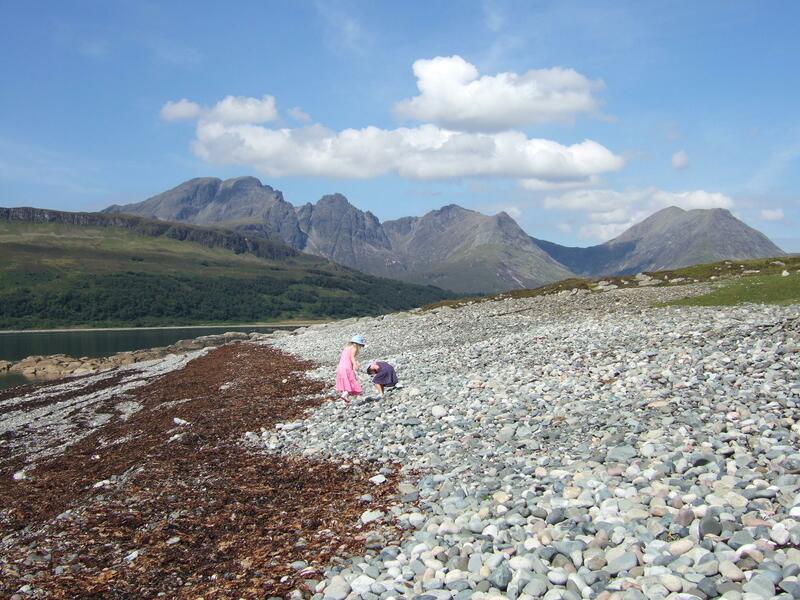 The world’s most scenic picnic spot. Maybe. imagination muscles, but I had no choice – listening to Midi role-play 7 or 8 parts in a progression of sillier voices was high entertainment. After tiring of playing on pebbles and all 3 minxes doing their synchronised poo (why can’t they all want to go in the morning when we’re within walking distance of a flushing toilet, soap and water…?!) 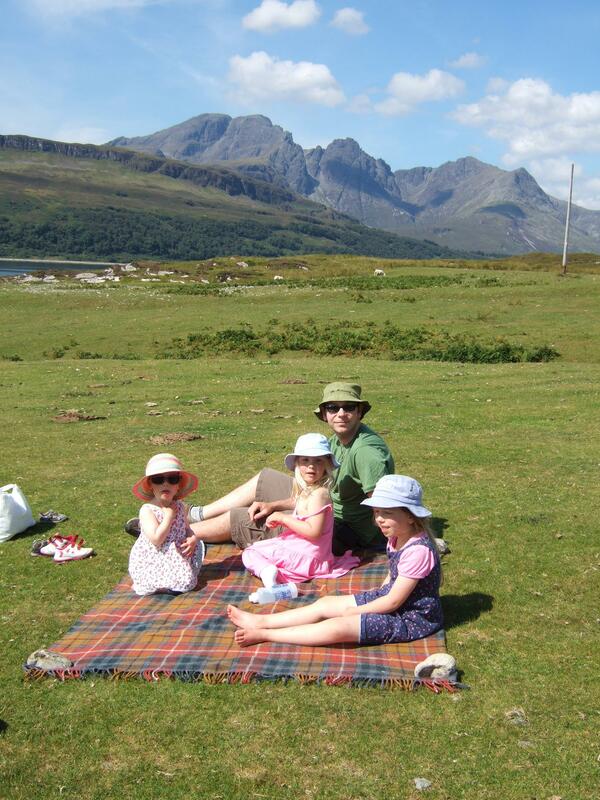 we had a picnic in probably the most scenic picnic spot on Earth. We went for a little walk further along the track uphill. 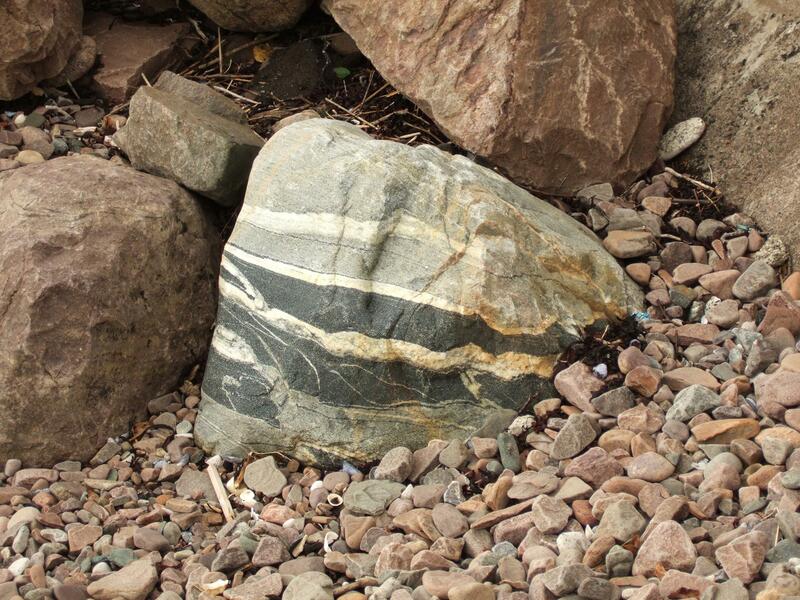 The minxes happily clambered over every boulder in sight until I spotted one at the side of the track with bits of balled-up toilet tissue at its base. It didn’t take much investigation to realise that my first suspicion was right – someone had pooed right at the base, wiped their lazy bum, and just left their detritus there. Disgusting! 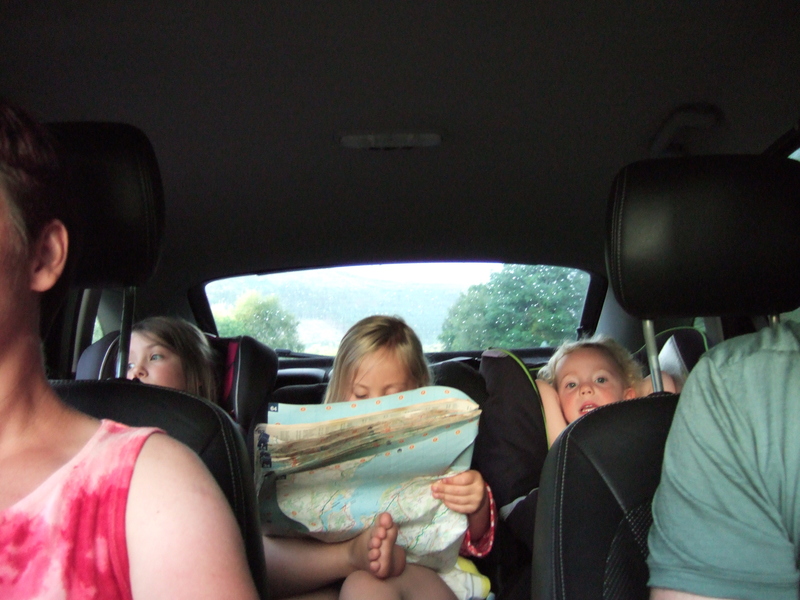 I know that sometimes you’ve just got to go (I’ve got 3 kids… I know! I know!) but it only takes a few seconds to go a bit further off-track. I realise that not everyone carries around nappy sacks or poly bags like I do, but would it have been so difficult to at least have attempted to bury it? I’m not expecting latrine depths, here, just a bit of an attempt to get rid of toilet tissue? Obviously not. Obviously that person believes that their personal comfort and convenience is of supreme importance; certainly enough to litter and poison a beautiful landscape and put my kids at risk of illness! 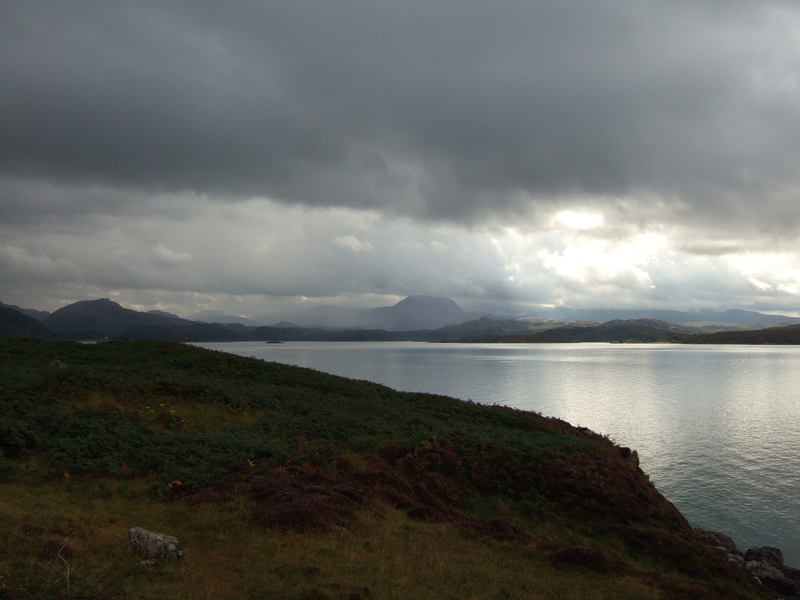 We decided to move on and see a little more of Skye. 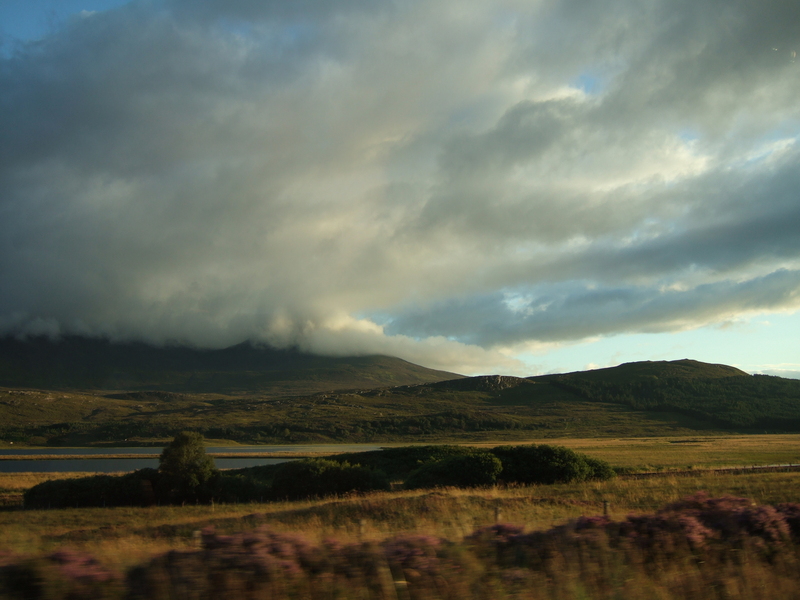 We drove to Portree and had an ice-cream (aye – yet another ice-cream!) and picked up more provisions. The minxes saw the pastel-painted houses on the seafront. I suggested that they might be a bit like those in Balamory? 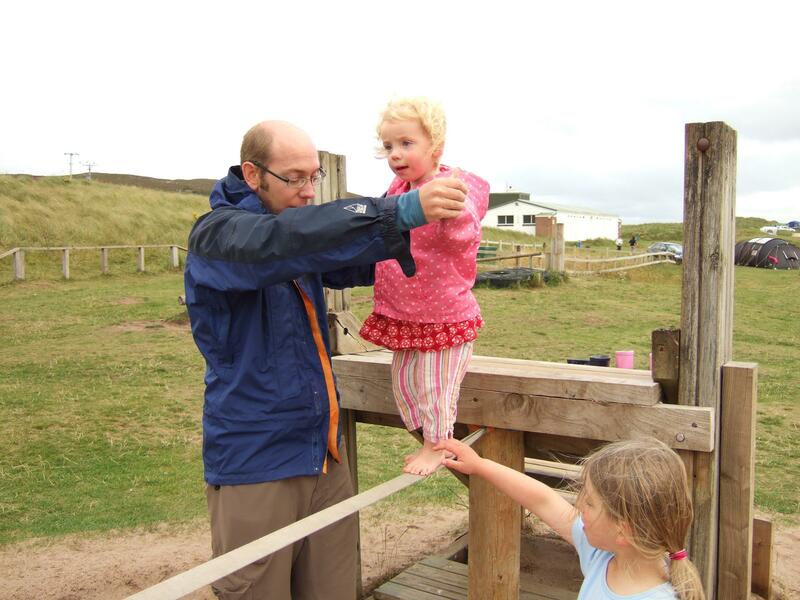 They scoffed at silly mummy – that was a few islands over the way! Nest (I very rarely read fiction: no time and no motivation, but I made an exception for the Millenium trilogy). I think that night, though, it was a struggle because the minxes had passed out in the car on the drive home. Absolutely nothing would wake them when we got to the campsite. We knew we were trading peace and quiet to make dinner for peace and quiet at bed-time. And they looked so angelic! To be fair, they were snoring before the sun had completely set. 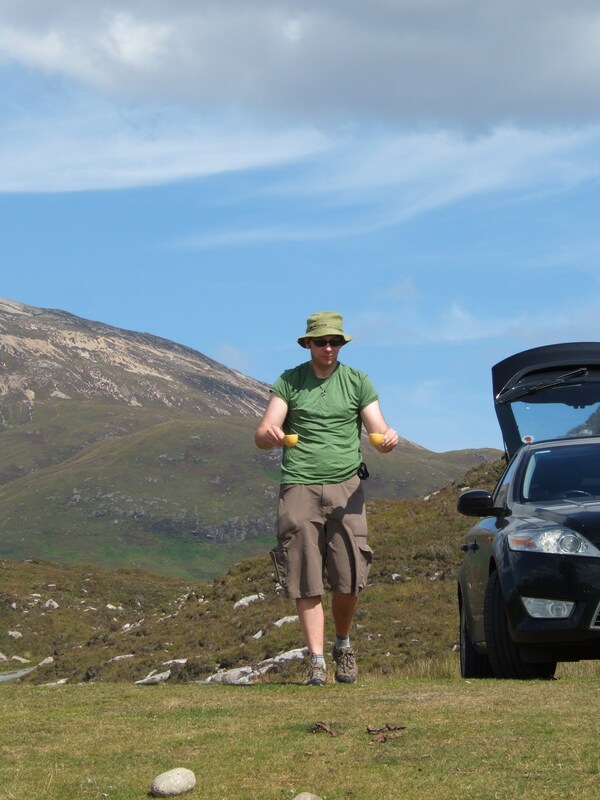 So… how did the overnight camping exped go? Well, we all survived and had fun, but the neighbours didn’t get much sleep. Oops. I think second time round it will probably take around 30 minutes with both me and The Boss doing it together. I think my first mistake was getting the girls’ excitement levels to Level Incredible by letting them watch me put up the tent. Their eyes were spinning in their giddy little heads by the time I finished. Second mistake was letting them take out some marshmallows in little pots as a treat. Actually, that could have been worse – I was tempted to let them have them threaded on a skewer. As it was, they just made a few thousand very sticky messes. Third mistake was letting them take their favourite teddies with them. Around 2am when the temperature dipped to 2.1degC (according to the Met Office actuals) Maxi Minx woke up cold, but refused to put on her down jacket that I’d put in the sleeping compartment: it was keeping Bagpuss warm. Fourth mistake was probably not warning the neighbours. I guess hearing a baby crying outside at all hours of the night and morning would be unsettling to most people. 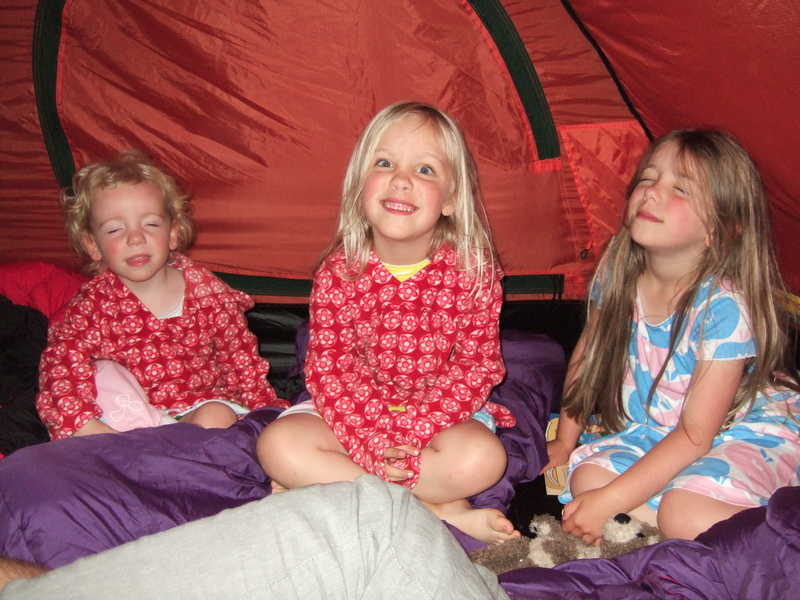 To be fair to the girls, after they raced around the inside and bounded over the mattresses, leaving trails of marshmallow mess at toddler height, they quickly settled into their new sleeping bags. I’m so glad I bought 3 season ones with lovely thick neck baffles – I hadn’t intended to take them camping in weather as nippy as 2degC, but apart from Maxi, they stayed plenty warm enough. And they both loved the bright purple colour (!) Luckily their Grandma had happened to buy them mechanical torches each, so they were read their bedtime stories by torchlight. Within 30 minutes, Maxi and Midi were snoring, cuddled up side by side. After another 30 minutes of watching poor little Mini race round and round like a hamster in a wheel, howling and crying, I realised that she just needed help realising that it was bedtime. So I cuddled her into mine and The Boss’ zip-together-into-a-double sleeping bags, stroked her head, and recited our normal nap- and bed-time goodnight list (“Goodnight fishing boats; goodnight seagulls; goodnight Daddy; goodnight Mummy; etc”) It worked like a charm and she was soon snoring louder than anyone. Unfortunately she didn’t stay asleep. Ouchy cutting canines put paid to that. So by the time everyone else was awakened by the shrieking seagulls nesting in the cemetery next door around 5.30am, I’d not had much sleep… Luckily The Boss slipped right back into our old camping routines and fetched me a hot coffee in my sleeping bag as soon as he woke. God, how I love that man! 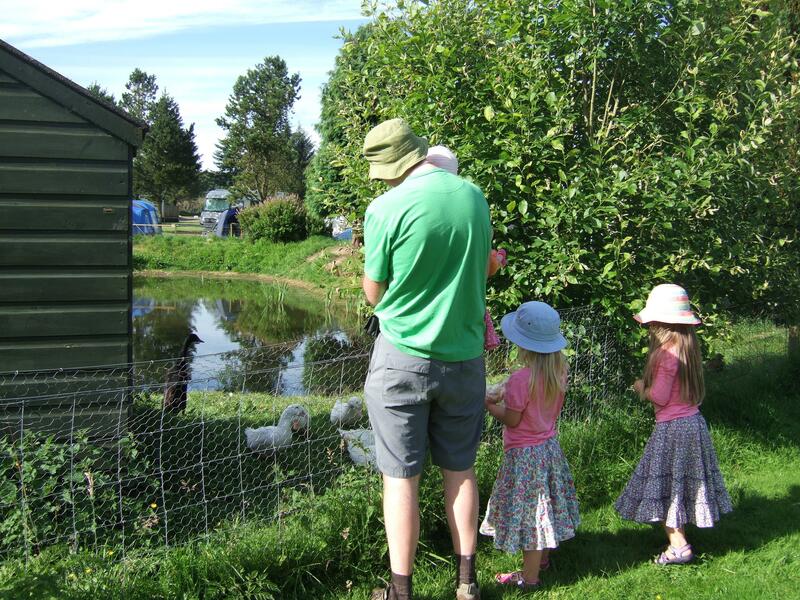 Well, now the girls have got their first camp-night jitters out their system, as I type this I’m trying to book a few nights’ stay next week over near Aberdeen. I can’t wait! Sun, sun, sun, sun, sun. Yippee! 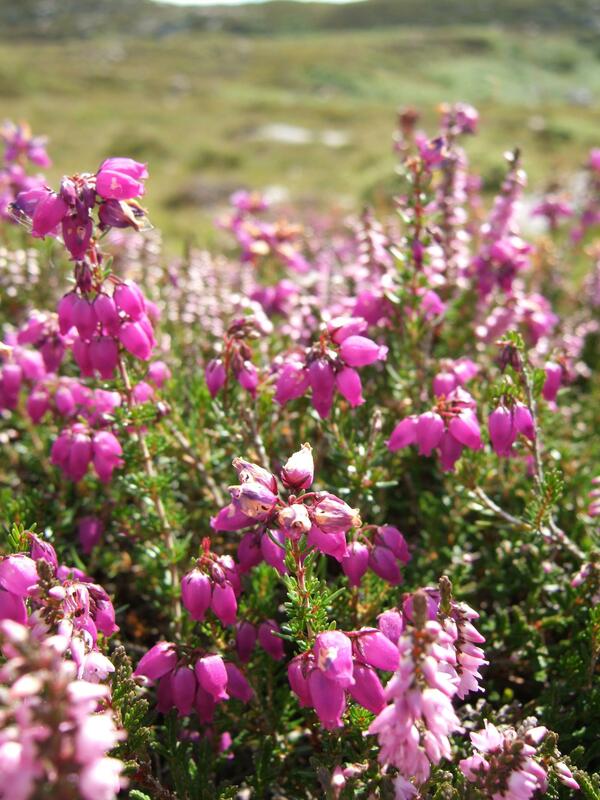 Spring has hit the Moray Firth coast with a splash of colour, dithers of big fat bumble-bees and today I saw my first butterfly. That means it’s time to finally introduce the minxes to mine and The Boss’s favourite sport of… camping. 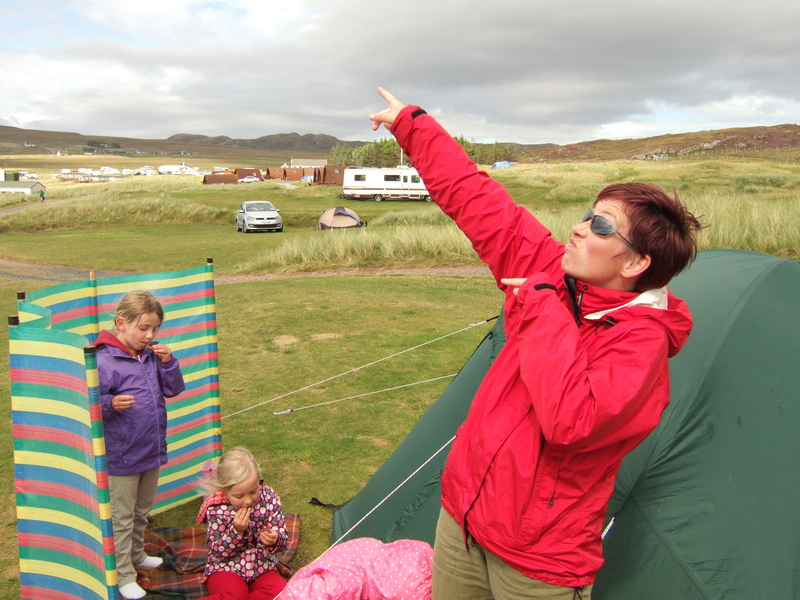 Pre-kids, we camped every weekend, all year round. In the garage we had 2 washing crates of carefully packed camping supplies: if we were going for a weekend we took one, if for longer, we took both. Camping was a means to getting to do what we wanted in life without wasting time driving there, or making polite, hurried chit-chat with B&B owners. So come Friday night we’d load the little Puma (or Corsa if we were taking the tandem), drive to the other end of the country, spend a quick 20 minutes setting up, then a leisurely hour or 2 unwinding over a bottle of warm white wine and packet of broccoli & cheese pasta packet sauce. Then whip out the stovetop espresso maker, like this one, perfect for the little single ring gas burner in a tin box. Then we’d spend the entire weekend climbing, cycling or walking (depending on what my current injury was – I’m a bit clumsy, me). Anyway, when Maxi Minx arrived, we camped 4 or 5 times, only stopping when all-day morning sickness from the impending arrival of Midi stopped me wanting to venture out, much. Since then, we’ve talked and talked about resuming our old life. 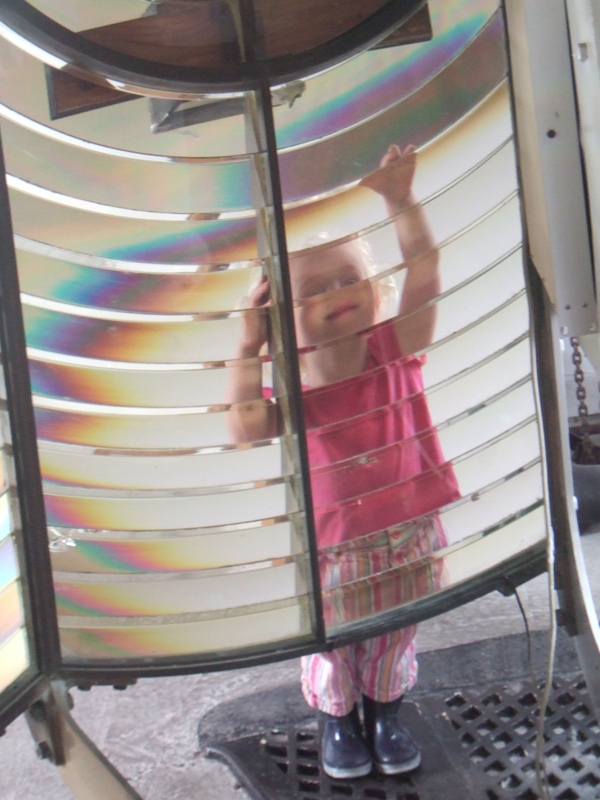 We determinedly want the girls to grow up to believe that weekends = live outside. Now Maxi and Midi are old enough that we can cope with keeping a slightly more relaxed eye on them whilst keeping Mini safe. So it’s time to go for it! We started to dither about tents. Which brand? What size? How many berths? Dome or tunnel? Price? It was absolutely overwhelming. After spending a night bamboozled at the sheer choice available, I whittled it down to: hydrostatic head of 3000 minimum, proven ability to withstand Scottish wind gusts, Vango or Outwell brand, side-by-side sleeping compartments for maximum minx-control, dome, compact (and therefore warm) sleeping compartments, 4-6 man (bigger would be fun, but putting them up whilst watching 3 little would-be escapees isn’t a good idea…), and under £350. The minxes new home-from-home. 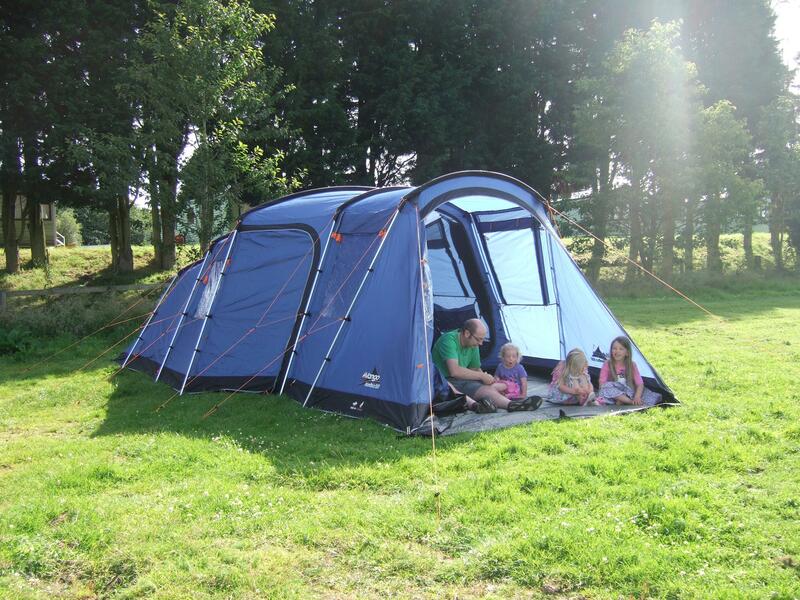 Photo from http://www.tauntonleisure.com, where we bought it from. Super-speedy service! Tall order? Not really. Me and The Boss compiled independent short-lists of 3. The only one on both lists was the one we went for: the Vango Maritsa 500. We got it cut-price, so there was money left over from our budget to get 2 really good sleeping bags for the elder 2 minxes (Mini can use the buggy sleeping bag still). It’s now lurking in the hall in 2 boxes. We aim to try it out this weekend in the garden. Wish us luck in our bid to brainwash the kids that dirt and camping are good!